Hungry? Need a quick meal? This is the recipe for you! I got all my ingredients at Aldi so this meal cost next to nothing; not only were our tummies happy, but so was our pocketbook. My husband said this was quite possibly the best soup he has had in his 26 years of life. I guess I will be making this one again! We left the meat out, but you could easily add cooked, shredded chicken or cooked Italian sausage. 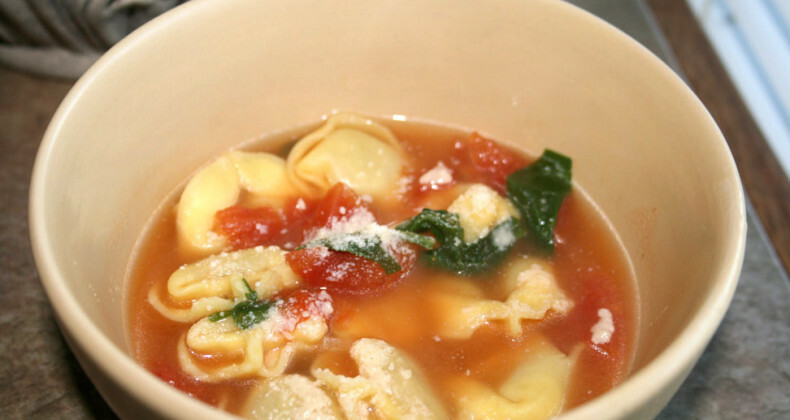 Bring stock/broth to boil, add tomatoes and tortellini, cook until tortellini are tender. About 12 minutes. Turn heat off, add spinach and stir. Once soup is dished into bowls add a sprinkle of Parmesan. ENJOY!